Home » Website Building » SEO » How to Submit Sitemap to Baidu in Webmaster Tools? Sitemaps can be submitted to Chinese search engine giant Baidu only through Baidu Webmaster Tools account for the sites added and verified successfully. Baidu webmaster tools offer Sitemap submission option to webmasters only on invitation basis. Based on your site’s content quality Baidu will decide whether to enable this option in your webmaster tools account or not. If your site is qualified you will see a “Submit Sitemap” button otherwise you will see the content in Chinese as shown in the below picture. 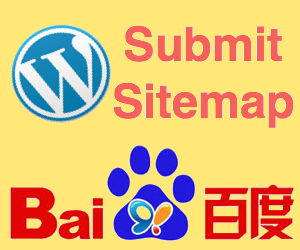 Sitemap submission option is available under Data Submission section of your Baidu webmaster tools account. Create your Sitemap in any of the accepted format by Baidu. Baidu accepts three types of Sitemap formats – Text format, XML format and Sitemap index format. Maximum of size of your Sitemap file should not exceed 10 MB. Once your Sitemap is ready then upload it in your site’s root directory. Login to your Baidu webmaster tools account. Select the verified site for which you are submitting Sitemap. Click on the “Submit Sitemap” button and submit your Sitemap. Baidu will crawl your site within one hour after a successful submission of Sitemap. Even though Baidu is a Chinese search engine ensure your Sitemap does not have any Chinese character which is not accepted by Baidu. Send an email to zhanzhang@baidu.com to clarify any questions regarding Sitemap submission. 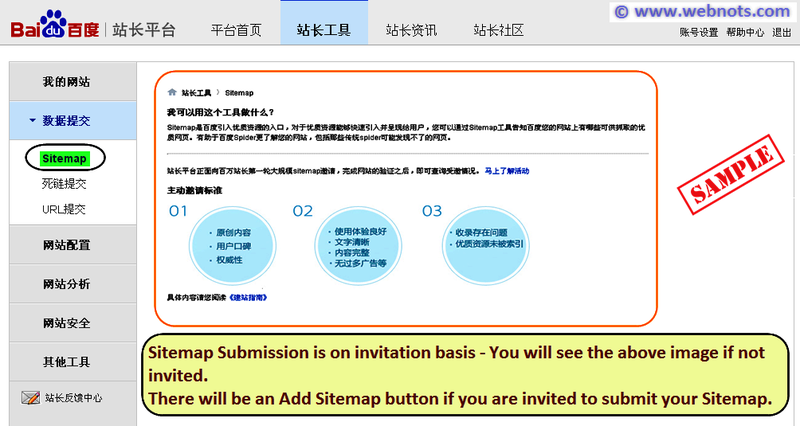 You can also send an email to confirm the possibility of getting invited for Sitemap submission in your Baidu webmaster tools account. I have tried to add sitemap to baidu but getting captcha code error. Is there any possibility to copy paste captcha. How to get an invitation for submitting sitemap? You can send an email to the email id mentioned in the article to get the possibilities of getting invitation for Sitemap submission.